Mining camps are one of the best locations in the West to search for coins and relics. This is due to the huge influx of people that came to this part of the U.S. in search of gold and silver during the 1800’s. Most of the earliest settlers of the West came because of mining. Mining really was responsible for building this country. While it’s true that many of us who like to metal detect in gold country are primarily interested in finding gold nuggets, searching for old mining relics in the nearby mining camps can also be a lot of fun. Some of the early mining towns are still towns even today, with many residences still living there even now. There is often still active mining taking place and some great coins and relics are still buried in the ground. Of course, these more well-known towns have probably been hunted before by metal detectorists. There can also be an abundance of modern trash in towns like this which makes it more challenging. The best places to hunt for relics now are probably the lesser known gold rush towns that are long gone today. These were the boom-and-bust mining towns that occurred all throughout the West. Gold or silver would be discovered and thousands of miners would flock to the area, only to abandon the town for richer ground only a year or two later. These abandoned mining towns are often completely gone today. Frequently they were wiped out by fire, leaving almost nothing behind. Today the land has returned to nature and there is very little evidence that there were thousands of people living there at one time. The miners who lived in these mining camps didn’t have much, but they did lose things just as we do from time to time. Old coins can be recovered in areas where people congregated, and there is an abundance of “junk” that they just tossed aside that are very interesting relics to find today. Relic hunting is very different from prospecting for gold nuggets. Relic hunters are usually more selective about the targets that they dig, since trash targets are so abundant in these old camps. Because of this, the preferred metal detectors to use are ones that have quality discrimination. Two of the most popular detectors today are the Minelab CTX 3030 and the XP Deus . These are awesome detectors, but they are also very expensive. With some persistence and practice you can still find plenty of great relics using a much cheaper multi-purpose detector like the Garrett ACE 250. If you already have a gold detector, you can still probably use it for relic hunting purposes. 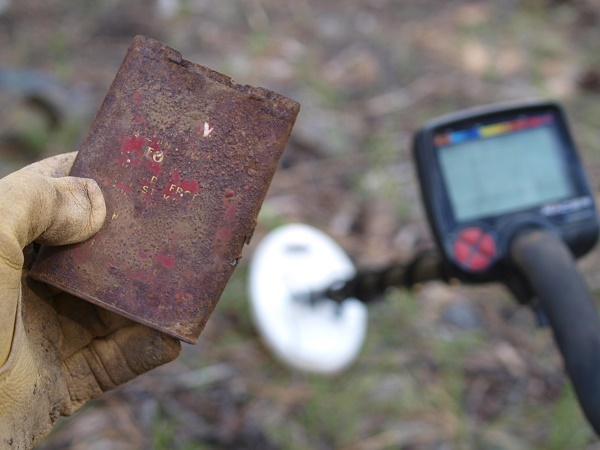 Modern detectors like the Garrett AT Gold or the Fisher Gold Bug Pro have very good discrimination features that make them quite capable of handling the trashy conditions you are likely to find when metal detecting at old mining camps. It’s always an adventure hunting old mining camps; you just never know what might be buried under the ground! You are likely to find a lot of mining tools and rubbish… things like nails, metal straps, shovel heads, etc. are all common in old mining camps. The old miners still used money in these camps, so there are plenty of old coins that you can find too! Relics might include buttons, snuff tins, old bullets, belt buckles, etc. Some people have even found old revolvers that were lost over 100 years ago. And remember, there is always a chance that a miner might drop one of their gold nuggets! The old mining towns were often built right on top of rich gold bearing ground, so don’t walk past a target if it might be a gold nugget, they are still out there being found.